Nope, I couldn't wait to come home and make this little reminder for myself! "Forget Not" by President Dieter F. Uchtdorf and other great talks from tonight's General Relief Society Meeting can be watched again...and again...here. I'm going to print this off and stick this on my fridge! I'm putting this on my blog too. And printing it out and putting it on my fridge too. Thanks for the cute reminder. I loved that talk and I have always loved Forget Me Not flowers in the spring time. Forget Me Not's have always reminded me of Jesus Christ because they bloom during Easter and the name has made me remember Him. I love that this little flower now has new meaning. I can't wait for next weekend. I love listening to our Prophet and Apostles. Wasn't it wonderful?! I love your reminder!!! Thanks Jocelyn! Excellent talk - and you beat me to the reminder! I had planned to do that exact thing! Thanks for the link to the talk..I need to listen to it again! You are amazing to have come home and made this sweet reminder. It was all so inspiring. Thanks for sharing and blessing to you! 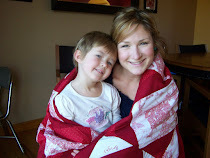 Check on Mormon Women for reviews of Celebrate Family 2011. I loved reading the posts and doing the review. Best Talk Ever! I'm printing these for me and my daughters! thank you! Love this! I just need to tell you that tonight during the closing hymn, there was a phrase that reminded me of your blog and the impact it has on so many of the woman. (I can't remember the phrase right now though, sorry) A few years back I had a very special experience while attending the temple. There was a specific moment when one of he temple workers, an incredible woman, came up to me and asked if I ever wanted to see angels. I was slightly startled by her question. Where that would be an incredible event, I certainly did not feel prepared in any way for such an experience, regardless of where I was at that moment. Anyway, after asking my that question, and without missing a beat she took me by the shoulder and told me to turn around and look. As I did, I saw exactly what she was seeing, who she was seeing. There in that sacred Temple were dozens of beautiful men and women dressed in white all there in the service of the Lord, doing work for those who cannot do it for themselves. No, they were not the angels that would first come to mind, but to the men and women whom they were serving they were angels. Ministering angels are not just those dressed in bright white, but as latter day prophets have taught, the can be anyone who is lifting the hands that hang down, serving a neighbor, nurturing a child, caring for the sick, even sharing a simple smile. I suddenly felt so close to that amazing temple worker, as well as each sister in that room. That day I did see angels united in the service of their God. Tonight, as I looked at the congregation, I saw thousands of angels brought together in unity and in love. Then I was kind of bummed that, though we are all sisters in Zion, they were all nameless (nameless to me because I don't know them) faces on that screen. But then I realized that it is incredibly possible that through your blog and facebook page, I could have interacted with many of them, and they could have interacted with each other, sharing ideas, giving support, counsel, advise, etc. It's so hard to put what I felt and realized during the broadcast into words, but seriously, do you realize just how incredible your blog is in bringing together, on a more personal basis, hundreds if not thousands (if not more) of woman from all over the world? Technology is incredible! Thank you for the strength, encouragement, ideas, and light that you bring to so many, and by so doing, allowing others to do the same. You are an angel! 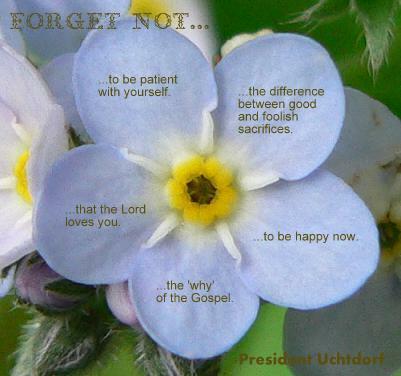 Loved President Uchtdorf's talk, love your wonderful forget-me-not graphic, and LOVE what Elise said in her comments! Thank you! Oh, I LOVE this, I already have it printed off, and ready for the refrigerator or a little frame in my room. Would you mind if I share it with the Sisters I visit teach? Thank you again for such wonderful inspiration! I love it, thanks so much for the quick reminder! I will use it and link to it in my blog! Thanks! Posted this on facebook and am figuring out a way to give it to my visiting teaching sisters (with a giant chocolate bar. ;)) Thanks so much! This is very cute. Thank you for sharing with us all. Thank you for putting this wonderful quote together so quickly. I also linked it to my blog! What great advice! Just wanted to thank you for the cute reminder of President Uchtdorf's talk. It has so much meaning to so many, in so many ways. My husband brought breakfast to me this morning while I am on the computer. I had told him so much about the talk and how touching and true it all is. When he came back to get my empty plate he had a square of ghiradelli chocolate in his hand. How greatful I am to be reminded of the important things in life. Wonderful idea- I shared your idea on my blog- beautiful. sugardoodle.net made one too and some other blog I read. I shared you image on my blog - it is so pretty! I loved President Uchtdorf's message! Love how you made his talk into a visual. And then shared it with all of us. Thanks Jocelyn! Lovely as ever, Jocelyn! Too funny how we both had to make a visual. I LOVED President Uchdorf's talk and was determined to find just the right photo and make a creative reminder...as I was searching photos, your creation popped up and was basically what I was planning to create. Thank you, for sharing your talent and saving me some time to work on something else! I love yours too! I actually prefer it to mine. What an inspiring blog you have! Pretty, but I had trouble getting a good printout, on photo paper. Does anyone know of a larger size version? This is just one of the best talks ever and it couldn't have been spoken at a better moment in time for me. Hi Bev - I know you probably won't see this, but I can't reach you any other way...your site with charities and patterns is wonderful. Perhaps there's something there for our next Service Boot Camp? Awesome Jocelyn! I was crying like a baby while listening to President Uchtdorf's message last Saturday, i felt like God was talking to me. What a great visual reminder! Thanks!! You must made the perfect visual of that talk. So cool! And you are about as talented as they come. Lovely reminder (made the local paper). lol I saw that you commented right when I changed the image...too funny. I loved yours but it wasn't big enough for my not-updated work computer. Thanks for you comment :) So glad I found your blog girl!! and let's talk about what you would like to do for a 'bootcamp'! I have loads of ideas, and the patterns too! You are the first to see it! Enjoy! Thank you so much Jocelyn! I made something similar and put it on our Relief Society newsletter this week! Thank you so much for the inspiration!!! A very cute reminder. I have always prefer to Forget Me Not flowers in the spring time. Forget Me Not's have always reminded me of Jesus Christ because they bloom during Easter and the name has made me remember bible. That little flower now has new meaning. I can't wait for next weekend. Listening Prophet and Apostles is my favorite. I really loved your blog and got a picture to put on my blog. The downloading of artwork, printing and distribution in classes is against copyright law and is dishonest, unless expressly and publicly allowed. Thanks for creating this beautiful visual. I am including it in our Stake Relief Society newsletter with your web site's address. I hope you don't mind/ I tried to find a way to email you and ask permission but couldn't find a way so I did what I could by giving you credit.